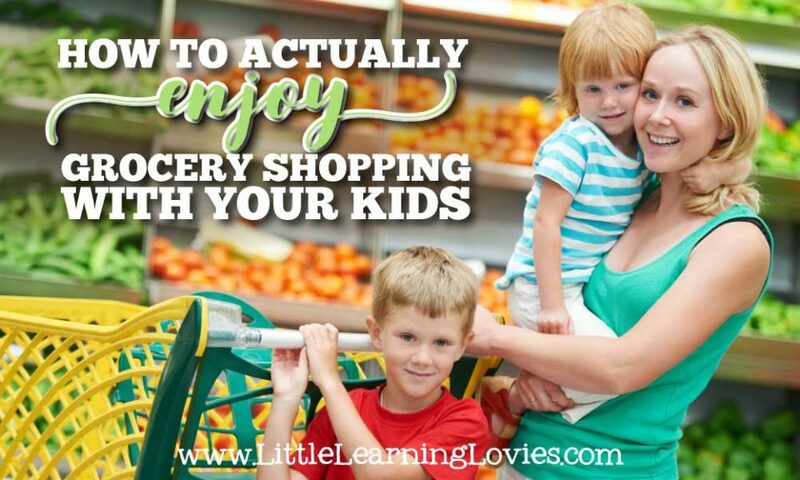 » How To Actually ENJOY Grocery Shopping With Your Kids! 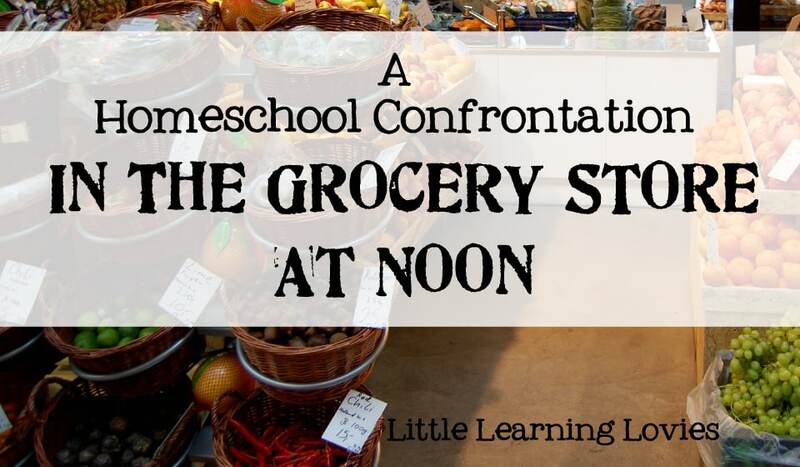 When I wrote about an unfortunate experience I had with a stranger at a grocery store a few years ago, a reader noticed that I mentioned how much fun my kids and I were having as we shopped. While this was a minor point in that larger story, it really struck a chord with her. How was I having fun with my kids in the grocery store? I understand her question. 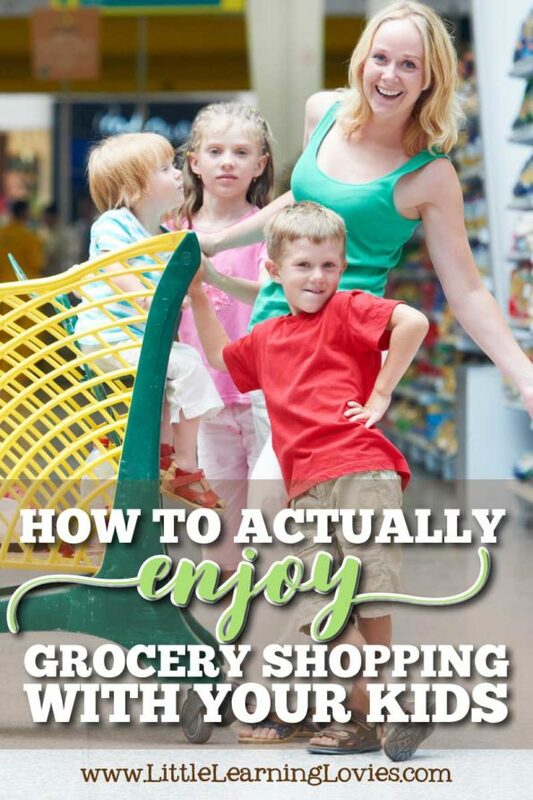 And today I’m here to share with you how it is possible to actually enjoy grocery shopping with your kids! Websites, blogs, social media… these all provide an outlet for people to share only their best. Embellishment can happen as writers portray their families in the best possible light. The ugly, dirty, messy stuff gets polished off and the reader is left with a gleaming example that is likely both misleading and unattainable. Since we are all aware of this, it’s easy to assume that’s the case here. Surely I can’t actually ENJOY taking my kids to the grocery store. If You Can, Start Young! 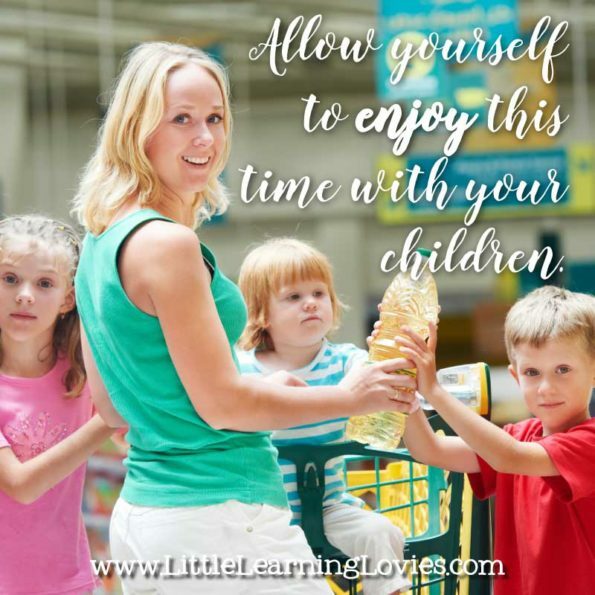 I’m going to be sharing with you some skills to teach your kids that are vital to having an enjoyable experience at the store. Some of these are pretty big things that are learned over time. And it is best if at all possible, to start out with these skills in mind, rather than have to retrain later when bad habits have taken hold. In some homes, children are viewed as a distraction from other work. Even if you think this isn’t the case in your home, take a good long look at how you are reacting when your child calls your name. If you and your children are not enjoying each other at the grocery store, it’s likely that you aren’t enjoying each other at home, either. Perhaps you sigh a bit before you reply. Maybe you grumpily grunt “What now!” or maybe your verbal response is kind, but inside you’re feeling frustrated at being called on for the one-million-three-hundred-thousand-nine-hundred-forty-third time that morning. Try reminding yourself that it truly is a privilege and a joy to have this child who needs you so much. I know it’s not always easy, especially near the end of a long day. I recently battled this very issue one night when my two-year-old asked me for some milk. It was a simple request, but it came after a very long and tiring day and I had just settled the rest of the kids into bed, finally, and had just sat down to what I expected to be a half-hour of relaxing, watching a show with my husband while snuggling that little boy to sleep. Now I was asked to go all the way across the house again to get him some milk. I was frustrated! And then I recognized the selfish thoughts that were ruining my enjoyment of my family and as I walked to the kitchen (it’s a long house… It takes me approximately 43 steps to go from living room to kitchen) I prayed. “Thank you, Lord, for the opportunity to love and serve my family.” At first, I said it a bit sarcastically, I’ll admit. I was not feeling truly thankful. But as I said it over and over (it took me three steps to complete this prayer… So I said it approximately 14 times on the way TO the kitchen and 14 times on the way back to the living-room) I found my heart filling with gratitude. I smiled as I poured that milk and then when I got back to my sweet baby, who smiled at the sight of me, I handed him his cup and scooped him up into a big snuggly hug, smiling with the joy of being his mother. THEN I got to sit down with my husband as we watched a show and I snuggled that boy off to sleep, no longer wishing to hurry him off to bed, content to just sit and love both him and his father. Personally, I tend to go through phases of being easily joyful and then of being easily grumpy. I haven’t found a pattern to it, yet, but I have learned to recognize the negative and to pray through it. This is a vital habit for a mother. Children can easily sense what your reaction to them in your heart is, no matter how you respond verbally. Don’t let your children feel that they are a burden, Mama! Let them be your greatest joy, and they will quickly learn to be joyful around you! In our family, we practice manners for different situations. We have home manners, restaurant manners, store manners, etc. We are at the point now where all I have to do is say “Remember we’re heading into the library. Remember to use your library manners!” Of course, if you’re a mom (and you probably are if you’ve read this far!) you know this phrase is not a magic reminder that will suddenly make all children everywhere behave perfectly at all times. And you probably know that this reminder didn’t work when I first started. I still had hope, though. And anytime we went out to eat, I continued to remind them of what was expected before we entered the situation, and then redirected while we were there. I noticed that I had to redirect less and less. Sometimes I even got to have a few minutes of grown-up conversation with the people we were dining with! Eventually, everyone learned what was expected and they learned, too, that their time eating out was more pleasant for everyone when they followed our simple guidelines. I’ll cover our easy rules for restaurants and other situations in another post. But this one is all about enjoying grocery shopping with your kids, so let’s take a look at what I expect (and get!) of grocery store manners. Be aware of and polite to other shoppers. Enjoy looking at items on the shelves, but no touching*. Feel free to draw my attention to anything that looks fun, interesting, or new, but without any expectation that I will buy it. Help wherever help is needed, with a smile. *As some of my children have gotten older and new children have come along, this rule has changed a bit. If we’re walking down an aisle, I discourage kids from stopping for more than a few moments to look at something interesting. But if we stop, as we often do, for something on our shopping list, they are welcome to pick things up that are interesting as long as they put it back as they found it and are ready to keep moving when the rest of us are. 🙂 It sounds more complicated than it is. It should be natural and easy for everyone. Not something to be legalistic about, but something to practice judgment with. As Mother, you set the tone for the whole trip. If you go grocery shopping with your kids without a clear idea of what you need to get and without an upbeat attitude yourself, you can’t expect your children to be cheerful and fun with you. First, when they DO try to be funny, you’ll find it distracting and possibly even annoying, and you’ll treat them that way. After all, you’re trying to sort out in your mind what you’re going to feed them all week and all the ingredients you’ll need to do that. Second, they’ll feed off of your mood and they’ll treat each other however you’re feeling. Still a bit mad about some transgression that occurred back home? The kids will know it and they’ll bicker. Tired and grumpy? Your kids will be, too. So you must do two things BEFORE you go grocery shopping with your kids. You must write down a list and you must be sure your mood is pleasant and ready to enjoy the gifts of happy children. You do NOT have to write out a menu plan or anything if you don’t want to do that. Just jot down the things you know you don’t want to forget so you can release that from your mind and allow yourself to enjoy your time together as you go grocery shopping with your kids . You can enjoy grocery shopping with your kids, too, Mama. Tell me in the comments (I read them all!) if you go grocery shopping with your kids or always go alone? How do the kids behave with you? Do you enjoy having them along or is it a burden? Do you think you could work on the ideas in this post to make grocery shopping with your kids enjoyable? What tips do YOU have about truly enjoying (not just surviving!) the grocery store with kids? This post went viral when I first published it. It was shared by all the major homeschool bloggers and introduced me to many of my current readers. I hope you enjoy reading it. I laughed when I read the title. Your points are valid and consistency with your trips is the key to helping with having fun. I have trouble shopping with all 8 of my kids because keeping track of them distracts me from being able to get what we need in a timely fashion. I enjoy taking them when I know the trip is just for a few items. I often grocery shop by myself, but do enjoy it when just 1 or 2 children come and we can talk and enjoy our time together.